^Yes. And from what I hear there is still talk of finding another location for tour buses. Lofter's Graphic 18, page 66 diagram above is correct. They have already removed much of the slurry wall to the west of the subway line. Will the VSC have a ventilation building? I must have seen it many times, but it never registered until a few weeks ago. They added a new support pylon (left in the photo) for the pedestrian bridge. At present, it doesn't carry any load. I guess the existing pylon will be demolished with West St reconfigured. Or remain on the sidewalk? Do you mean behind the backhoe where the temp bridge connects? Right, that will be smack in the middle of the future median. The ped bridge in the future will go straight, so a small extension (probably two more windows) will be added onto the end and will be supported by another pylon which will be built atop the new slurry wall. The existing pylon will be removed - it sits in what will be the second lane from the right of northbound West St. The real question is, will the pylon be in the museum? Why don't we put that crane in there, too. Will the pedestrian bridge be reconfigured to better link with the new park at the west end? Or will it be redone basically as before: A stub and steep staircase leading straight down? Not sure, I haven't seen any plans to alter that side of it. Well whatever it is, I hope they repair the bridge. It looks as if it's a bit crooked in this photo. That's one mucky looking pit, eh? I hope the South Bridge is restored. 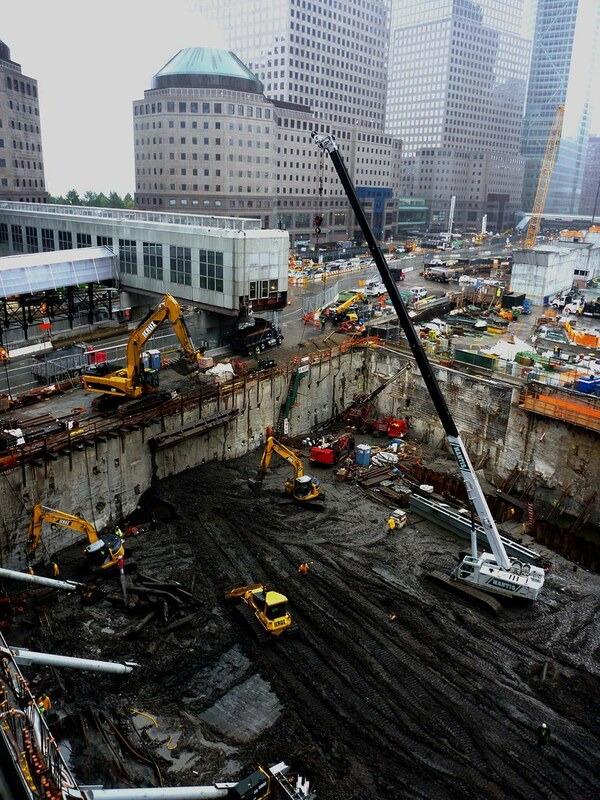 It is the last remaining vestige of the former WTC plaza as it existed pre-9/11.